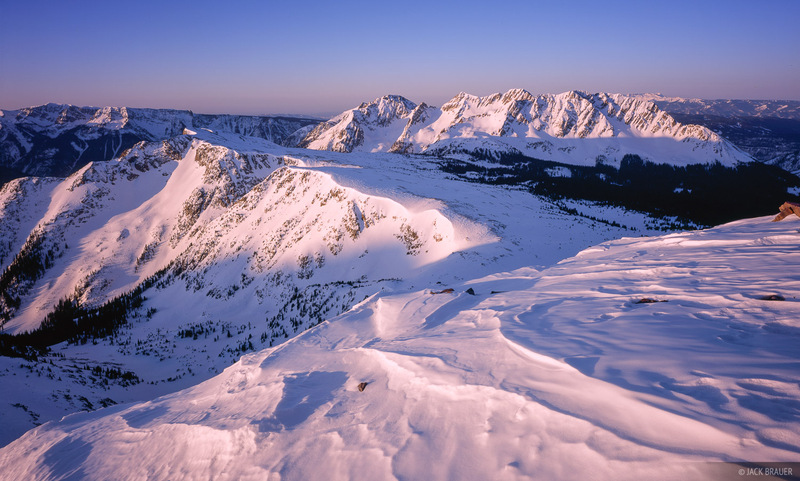 Lured by a full moon and a forecast of clear skies, in late March I went backpacking for two nights in the West Needle Mountains in the San Juans near Silverton, Colorado. This area is incredibly photogenic; from my campsite on a 12,200 ft ridgeline, I enjoyed broad vistas of the Needle Mountains, the West Needles, and all the peaks of the Molas Pass area. Camping in the West Needle Mountains under a full moon. After hiking about 5 miles on my splitboard, I made it to my destination – a high ridgeline with views in all directions. I was pleased to find a single clump of trees which provided a nice windbreak. Behind the trees was a large winddrift, which I easily carved out into a perfect tent platform, complete with walls around the sides. After setting up the tent, I put on all my warmest clothes, which didn’t come off for the next two days! Though the skies were clear and the days sunny, the temperatures were still very cold, and a constant wind made it feel even colder. Winter sunset behind Engineer Mountain, as seen from the West Needle Mountains. 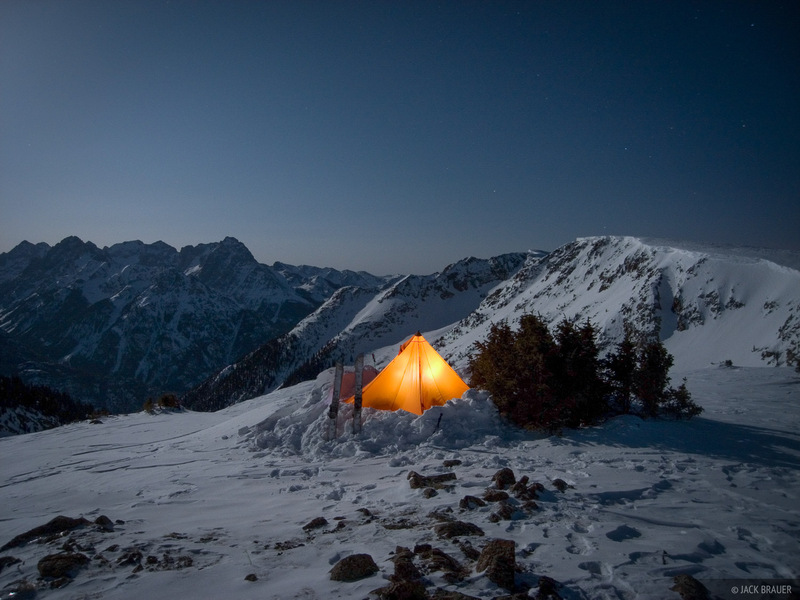 Each night I’d crawl into my -30º sleeping bag with two Nalgene bottles full of boiling water. Sleeping proved very difficult with the wind pounding the tent walls. Even though I knew the tent was secure, the noise was still disconcerting. Then it seemed that right after falling soundly asleep, my alarm would go off at 5:30am. The old saying that “The crux of the day is getting out of bed” certainly held true on these frigid mornings. It took all my willpower to get out of my cozy bag, put my cold pants and boots on, and head out out into the cold windy pre-dawn night to prepare for my sunrise shots. Sastrugi and North Twilight Peak. 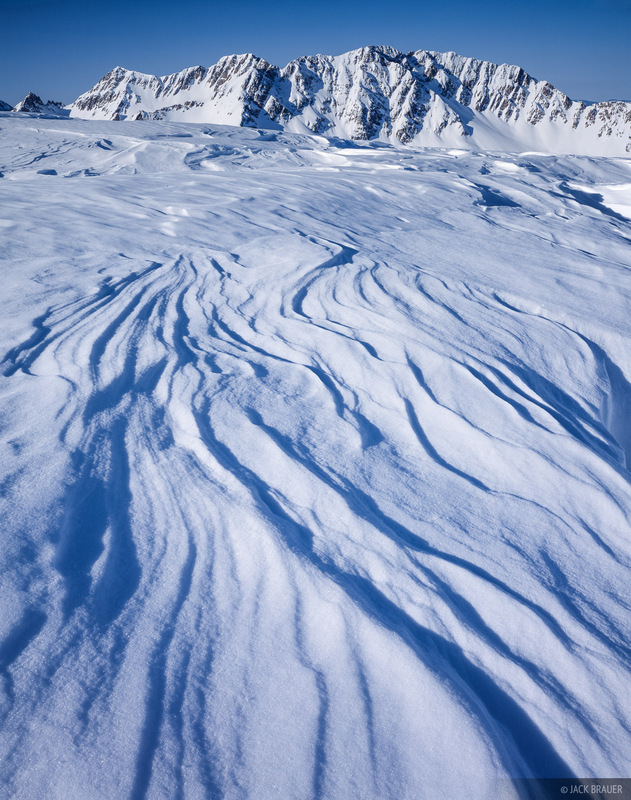 A fun subject to photograph was the sastrugi, or wind-sculpted snow formations. All the crazy waves and ripples make for an infinite number of compositional possibilities. Towards the end of the second day, I realized that I was running out of film and had to ration the remainder for the final sunset and sunrise shoots. I ended up shooting all 30 sheets of film, which is quite a lot for me with my large format camera. I’ll have the film back by the end of the week and if I got some good shots I’ll post them on my gallery site. 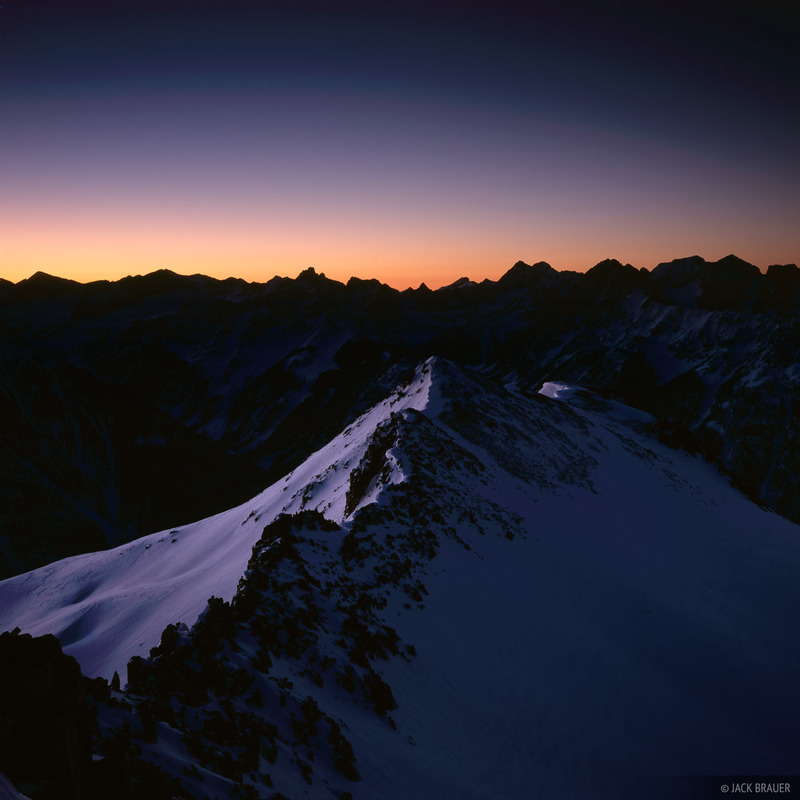 Dawn breaks behind the Needle Mountains, as seen from 13,000 feet up in the West Needle Mountains. My 4x5 large format field camera up high in the West Needle Mountains. Winter camping in conditions like this is brutal and challenging. Everything is more difficult in the snow and the cold. During the trip, I realized that I would probably never do this if I wasn’t into the photography. 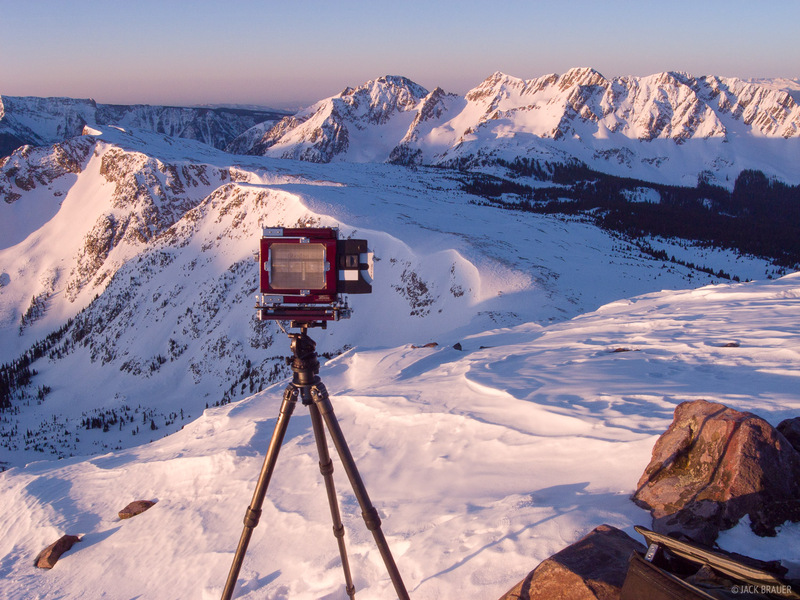 Interesting, and another example of how photography has served to boost my motivation to get out into the mountains. This was the first real camping trip I’ve been on since my month in Patagonia in December. I’ve been so busy with my business and my house during the last few months, it really was a treat to get out there for a few days with nothing to do but relax and concentrate on photography (and staying warm). For my next trip, though, I think I will head out to the desert for some real relaxation in warm weather!